Top 10 Posts of 2015!! The Black Mail Blog was launched in July 2015. Since that time, we’ve brought you 260 posts of facts, trivia, new, and quotes. Bringing you, “Black History: Special Delivery! !” has been a pleasure in 2015. Looking forward to 2016! Happy New Year! Check out our Top 10 Blog Posts of 2015! John Berry Meachum (1789-1854) was born into slavery in Goochland County, VA. Meachum’s owner moved several times; eventually settling in Kentucky. He learned carpentry and other trades from his owner. He used funds from carpentry work to purchase his freedom as well as the freedom of his father and wife. Before he was able to purchase the freedom of his wife, she was moved to St. Louis. Meachum followed her there and then purchased her freedom. While in St. Louis, Meachum met John Peck, a white Baptist Missionary. Peck had come to St. Louis to start a worship and educational center for Native Americans. Peck also saw the need to establish a place of worships for blacks as well and asked Meachum to help him. Meachum was ordained. He and Peck eventually started the First African Baptist Church in 1825. The church is still in existence today. The church was used to provide both religious and secular education classes for free and enslaved blacks. Meachum also used his resources to purchase the freedom of other slaves. The school drew up to 300 students. Initially education of free and enslaved black had been supported in Missouri. As racial tensions grew, education of blacks began to be viewed as a threat to slavery. This resulted in a law being enacted to ban education of free blacks and slaves. The law was not consistently enforced. However it did result in Meachum’s educational classes at the church being shut down. Meachum crafted an ingenious strategy to continue educating blacks in St. Louis. He furnished a steamboat and opened the “Floating Freedom School” on the Mississippi River (which was under federal jurisdiction) putting it beyond the jurisdiction of Missouri officials. And this my friends is why she is still the undisputed QUEEN OF SOUL! Check out Aretha Franklin singing, “Natural Woman” at the 2015 Kennedy Center Honors! It is astonishing to consider that “Kids Who Die” was written by Langston Hughes in 1938…..77 Years ago! The words are still ringing true even today! The poem is narrated in this video by actor Danny Glover. This is for the kids who die, Black and white, For kids will die certainly. The old and rich will live on awhile, As always, Eating blood and gold, Letting kids die. 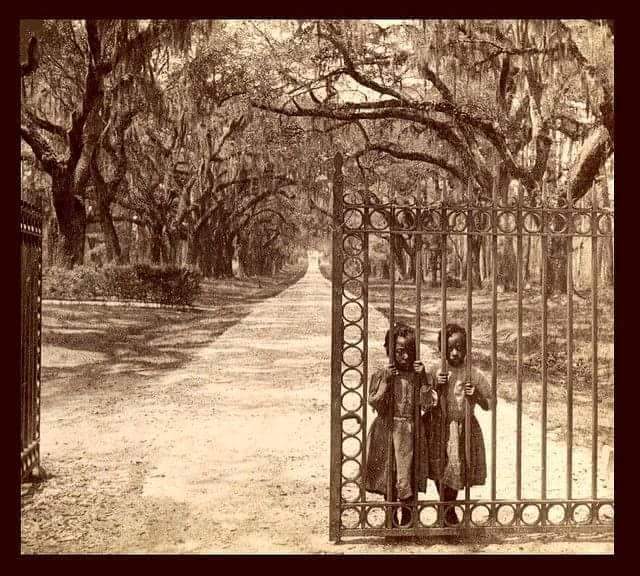 This image was taken on a plantation. This picture grasps the irony of oppression, even today! There are times liberation from our oppressors is within our grasp and we choose to stay oppressed! The mental chains can often make physical chains unnecessary!